Kunstraum Kreuzberg/Bethanien has generally been consistent in what it offers the art world and the wider public. ­Stéphane Bauer has led it long enough for distinctive operative criteria to emerge for curators. Bauer believes passionately that art must have a social function and the exhibitions reflect this belief. For Bauer, the audience is not only the clique of artists, curators, gallerists and collectors which shapes and informs the structure of contemporary exhibition practice in Berlin, but also the general press and public. Outside the building stand two signs declaring “Kunst Quartier Bethanien” and “Art Center Bethanien”. The doubling of this sign, its existence in German and English – signalizes a clear declaration of loyalty to the commercially dominated global art context, and adherence to its unwritten rules. Within this global context, the belief that art has a social function, or a political role, is tolerated, but ignored as far as possible. It’s a difficult position to maintain. Opaqueness is the goal of the commercial sector. It’s the point at which art sells. Galleries will never cease their work of mystification, of artworks and artists, in the hope of a huge long-term payoff. The attitude is broadly: “If you want peer-reviewed transparency, go do some science”. The shows at Kunstraum Kreuzberg/Bethanien tend to high concept: an overarching theme; a thesis that is exemplified by the exhibition; the formulation of unanswered (and sometimes unanswerable) questions which leave it up to the spectator to decide if the exemplified thesis rings true or not. Reception is thus atomised, despite the high concept stance, and atomising reception is one of the unwritten rules: don’t theorize anything more than questions – the formulation of possible answers is a threat to the carefully agreed consensus of ignorance which allows gallerists to say even directly contradictory things about their artists as part of their value creating goal. Indeed, gallerists say different things to different people. So, the role of Kunstraum Kreuzberg/Bethanien is sharply limited, but nevertheless important. That said, sometimes the exhibitions here appear more concerned with a theoretical or quasi-theoretical superstructure than the presentation of the individual artworks themselves. The discursive atmosphere that shows here generally create leaves the spectator thinking not just about the exhibitions here and their encounter with the works but also about how hungry they are, or what to cook tonight, or the fact that Bauer’s rooms are not very white cube. Not very white cube at all. Entering the Kunstraum, you see the first problem that assaults any curator wanting to organize a show here: a bar/lobby/shop area where a desk is often also put up for whoever is invigilating the exhibition. Dead space. But this time it is different. Zoë Claire Miller and Eli Skatvedt, artist-curators of the ­exhi­bition, have positioned here a table height 3D glass vitrine, which is filled with curious and comical objects. All have the aura of a Duchampian ready-made, and that interesting, that sets a limit, because these things are not art objects, but things borrowed from the remarkable Museum der Dinge (http://www.museumderdinge.de). Their museum status already achieved, they are no longer available to artistic appropriation. The title card reads: Kopf; Hand, grün; Stein/Korken; “Milchwächter”; Reibe; Isolator; Hand, durchsichtig; Backform für Donauwelle; Tischgerät, 50er Jahre; Dingart Holz Hantel; Holzbein; Büro, Stab mit Siegel; Abdrückplatte Metall; Mehrfachstecker; Klickschalter weiß/rot. Thanks to 1917’s Fountain, all these things have a visual poetry, just as the title card carries a written one. 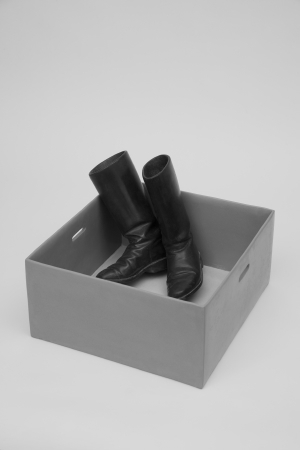 We give all these objects the extraordinary attention (engagement) Duchamp did himself. But we are frustrated, for they are not art. The glass case is a room within a room, setting the stage for the 15 very different art installations. For most shows here, the worn physical fabric of the Kunst­raum Kreuzberg/Bethanien is painfully present, with its “corridors, nooks, and crannies, non-square angles, rooms feeding into others, traces of years of use, ad-hoc mountings, repairs and disrepair” (Zoë Claire Miller and Eli Skatvedt in the exhibition handout). Here, beyond the title, things remain unverbalised, emotional rather than cerebral: the rooms, instead of being primarily a non-white cube become bleached out, stretched, or contracted. “Objects in a Room”, has the slightly alarming effect of making Stéphane Bauer’s sanctum for socially-affective curatorial practice into a space that does do the job of a white cube. It is the first time I haven’t minded the space’s physical problems. This curatorial feat, Zoë says, was primarily achieved by a hands-off approach: the curators apportioned spaces to the artists, and let them alone. The above-mentioned vitrine provides a very tangible context for all the artists, letting them negotiate their objectifications with a remarkable freedom. The good parts of this: artists like Thomas Schroeren. It’s powerful stuff: the central and dramatically spot lit “painting” “Tante Lisel”, red, gold leaf and green, its strips of purposefully reflective material emphasizing the frame … in an almost square mini-room, flanked on one side by a precisely positioned sportcoat, cardigan and shirt, hung on a hanger on a nail (“Schuld und Sühne”, 2014), as if the owner had done a Lee Lozano-like disappearing act, a Duchampian act of distancing. This is not the place to intellectualise: these are gestures that are reduced and precise and the picture and the clothing share their dialectic with a wooden bow, which is the back part of a wooden chair propped against the wall. This was perhaps the most successful part of the exhibition, apart from Zoë Claire Miller’s and Aurora Passero’s excellent shared space, Miller’s sardonic, fragmented, and referential wall-mounted ceramic objects – including one piece ceramically documenting the death of a laptop – positively complementing Passero’s hanging textile and acrylic glass trapezes, searing colour applied to the material by the use of raw colour pigment. There’s a handmade feel to much of the work, ­Miller’s ceramics echoed by those of Lisa Tiemann, whose mostly circular ceramic hoops – colourful and heavy, but still nervous and formally light – are paired in the one case with Schroeren (his room gated by a walk-through room of these circles); in the other case by the absurd and humorous large scale sculptures of Jens Nippert, somehow close to ceramics in their materiality: reeds, paper towels on a roll, a plastic sack filled with polystyrene filler material, which looks like a pillow. Something handmade, almost domestic. Other artists fit this feeling: Jessica Jackson Hutchins with her weird mixture of personal belongings and ceramics, offsetting paintings almost as strange; Andreas Blank’s laboriously carved stone objects, which mimic “everyday” objects, such as his grandfather’s WWII army boots, worn on the Eastern Front; ­Antoanetta Marinov’s poetic investment in ready-mades, which leads her to collect in jars the dust from galleries which she sweeps up before she installs her own work, and exhibit them as a work in process. There’s a split between artists who definitely craft their work, though under the shadow of the Fountain; and artists who use found objects as a starting point. (It is important to note here the difference between found objects and ready‑mades. 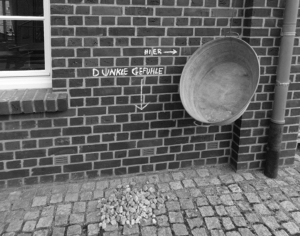 If the number denotes the number of artistic interventions in the object, then we can write Found-Object = 1 Ready-Made > 1).